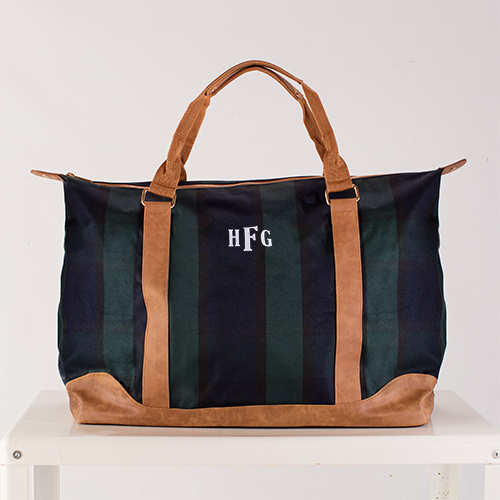 Make your carry on bag extra stylish this year with a classic embroidered navy and green plaid weekender. Wherever you are traveling, this monogrammed plaid weekender is sure to be your favorite travel bag. We will custom embroider this for personalized bridesmaid bags and more with any 3 initial monogram (first initial on the left, last initial in the middle, middle initial on the right) in coordinating embroidery thread to make a personalized statement piece. Add the coordinating shoulder bag and zip pouch (sold separately) to make a beautiful travel set for you or anyone on your gift list that loves to travel.